Christmas cookies, candy canes, cupcakes, pie, hot coco, party mix, peppermint bark, fudge… you name, you’ve probably have had a bite or two of these sweet treats during the holiday season. What if I told you, that those treats are not what you should be as concerned with. You actually should be more cautious with the foods you are eating every day. Most Americans get more than 22 teaspoons — or 355 calories — of added sugar a day. There are the obvious places like candy, soda, cookies and the white stuff (white bread, rice, pasta). But most of our hidden sugar intake is lurking in foods that we consider “healthy” like wheat breads, salad dressing and yogurts. The package might read “whole grain, high fiber, low sugar, smart choice, organic, good source of fiber…” but how do you really know if what they are saying is true? Well a simple solution has arrived! The Altman Rule, brought to you by a new non-profit that is forming call the Wellness Campaign.org. This label reading rule allows for you to get past all the tricks and jargon the food industry throws on the package and allow you to determine if this food has too much hidden sugar, in less than 10 seconds! This is a brilliant rule because it tells you if there is more “good” stuff (fiber/protein) in a product compared to “bad” stuff (sugar). 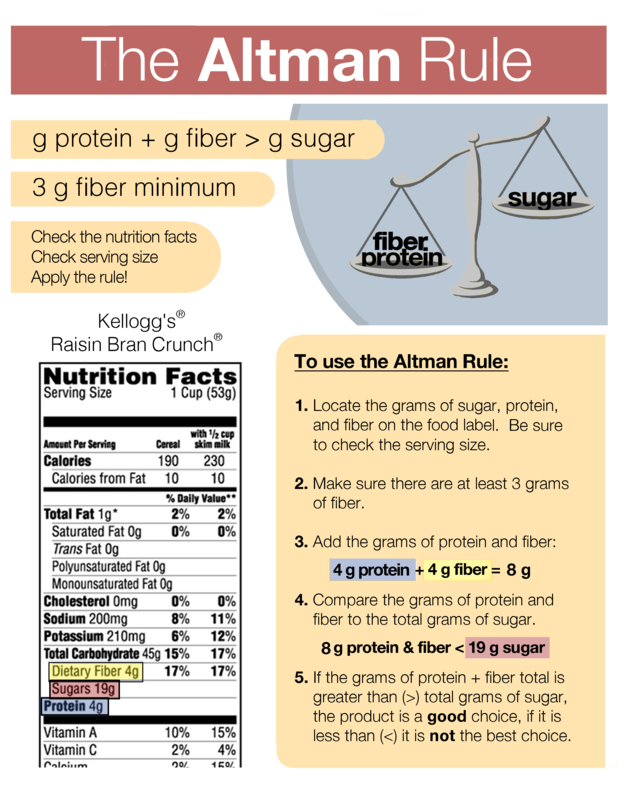 If there is more fiber and protein in a product than sugar it will likely keep you full longer and be a lower glycemic index choice. This rule can be applied to most packaged foods, cereals, breads, cracker, yogurts etc. After taking a closer look at your pantry and food choices many of you may realize sugar is the big road block for you in reaching your fitness, health and weight goals. But do you how to move past this sugar road block that and reach your potential? Well starting January 13th 2014, My Nutrition Upgrade is offering their Hidden Sugar Detox. This online program is perfect for busy people who want a sane approach to cutting sugars. So still pay attention to those obvious sweet treats this holiday, but I challenge you to take a closer look at your pantry, because those extra sugar calories are likely coming from foods you eat every day! This entry was posted in Altman Rule, Creating Change, Healthy Holiday Advent!, Snacking, Uncategorized and tagged Altman Rule, food choices, Holiday, Snacking, Sugar. Bookmark the permalink. 1 Response to December 7th… Hidden Sugar Swap! Awesome video. Think I might try it.